For its birthday, Svalbard will receive seeds from war-torn Syria and celebrate years of success preserving our inheritance from Neolithic times. The world’s agricultural hard drive, the Svalbard Global Seed Vault, turns four years old today. The vault was a media sensation when it first opened in 2008, but it hasn’t been in the news much since. I figured it was time to check in and see how these first four years have gone. An awesome technology by any measure, the vault is a steely compound tunneled five hundred feet into an icy mountain in the Norwegian Arctic, just 600 miles from the North Pole. It is designed to last a thousand years, and to withstand a wide range of global disasters, including climate change, nuclear war, and even an asteroid strike. Over the past four years the vault has amassed some 740,000 seed samples and eventually it may house every crop seed ever used by a human being. Security at the facility is state of the art and fully automated—there is no full-time staff and no single person has all the codes necessary for entrance. Nor is there much traffic inside, for new seeds are only accepted a few days a year. Today’s fourth anniversary will bring several new seed shipments to the vault, including an ancient grain called amaranth, a favorite of the Aztecs and Incas, and a malting barley from the Pacific Northwest called “Klages,” which is used in many craft beers. Cary Fowler is the Executive Director of the Global Crop Diversity Trust, which maintains the vault in partnership with the Norwegian government and the Nordic Genetic Resources Center. I talked to Cary about the vault’s anniversary, its importance, and the future of agriculture.When I think about the seed vault, the first thing that stands out to me is that it’s really a technology of deep time, a way of coping with the kinds of events that happen on very broad time scales. Do you see any other technologies or institutions outside the world of agriculture as playing a similar role as yours?Fowler: I haven’t given it a lot of thought, so I guess I would say no. We tried to design this facility to last as far as we could see into the future. We didn’t actually plan this to be what some in the media have called it, which is a doomsday vault. We’re not people who run around with signs saying “repent the end is near.” In fact we realized that unfortunately the vault was probably going to be used sooner rather than later. Just a couple of weeks ago, for example, there was a fire in the national gene bank in the Philippines and two years before that they experienced a flood, so you don’t have to have some kind of global catastrophe for this thing to be useful. We’re losing biodiversity right now, and it isn’t necessarily because of some global catastrophe.But of course I have to acknowledge that even though we weren’t planning for doomsday, the facility is such that it would provide a lot of protection for many large catastrophes depending on where they occurred, but that wasn’t the original impetus for the project. The main tunnel down to the vault. You first opened for seeds in 2008, which means you’ve been at this for four years now. What’s the most surprising thing you’ve learned in that time? Fowler: Things have moved a lot faster than I expected. I think most people thought that the day we opened we would have every seed that we wanted or needed, or that it would come shortly thereafter, but those of us in the field know that that’s not the way it happens. The seed banks themselves are typically not sitting on such large quantities of seeds that they can just immediately divide them and send them up to the vault in Norway. Even though it’s for safety purposes, they still have to multiply the seeds and clean them and package them up and send them, and that takes time, and so it’s been a nice surprise to see how quickly things are moving. The other surprise is that we’ve had no bad surprises. When you plan something this complicated you figure something is going to go wrong. During these past four years we’ve had seeds come from all over the world and it’s been a gigantic coordination process to try to get seed boxes from all of these locations, a lot of which are in developing countries—Africa, Asia and Latin America—and to try to get them up to Oslo and then up to Svalbard on roughly the same day, so you don’t have them sitting out on some tarmac in the hot sun. It’s also surprising that we haven’t lost a single box of seeds in transit. It’s a miracle. Where does the seed vault rank on the list of agricultural innovations, from the first crude stone sickles to the more sophisticated technologies of industrial farming? Fowler: It’s hard to say. What we hope to do is to provide robust and secure conservation for what’s left of agricultural diversity. This is the inheritance of the Neolithic times and our time and everything in between, and so I guess I see it as a library, a library of life, that gives the history and culture of agriculture and protects it, but it’s also a resource for the future. And so I’m not sure where it ranks, but I do think it’s extremely important given the challenges that agriculture is facing right now, but it’s not in and of itself a solution to those problems and it’s not the only thing we should be doing. As you see it what are the biggest challenges agriculture is facing right now? Fowler: Climate change is obviously the big one, but there are others; water availability is a big problem, so is nutrient availability, particularly phosphorous. And all of this is in the context of growing demand, both from increased population and from development pressures. As people get wealthier they tend to gravitate towards more meat-based diets, and it requires a lot more agricultural crop production to produce that meat. So we have all of those things happening and at the same time we don’t have huge increases in agricultural investments, and so in a way we’re really behind the game in terms of producing new crop varieties that are going to be adapted to these conditions. We need our crops to produce more on less land, with less water and less nutrients, and in a changing climate. Any one of those problems could be extremely daunting, but we’re facing all of them at the same time. Cary Fowler is the Executive Director of the Global Crop Diversity Trust. Reuters. Are there scenarios you can envision that would render the earth’s environments entirely inhospitable to seeds? Fowler: No. If the projections are correct it’s certainly going to get more inhospitable, but not entirely inhospitable. The issues that I mentioned before—nutrient and water availability and climate change—are going to cause some fairly radical readjustments in agriculture if you look down the road any distance. And that’s one of the things that differentiates us, the people involved in the seed vault from others, we do tend to have a long view of what’s going to happen and we’re trying to plan for that. We expect that agriculture would even survive something like an asteroid strike; after all, plants survived the last one. What we’re really trying to do up in Svalbard is preserve options. We’re not saying that we have a crystal ball and that we know what’s going to happen and we know what’s needed, but we do know that the diversity we have represents an immense number of untapped options, and what we’re trying to do is keep all of those options. I think it was Paul Ehrlich who said “the first rule of intelligent tinkering is to save all the parts,” and that’s what we’re trying to do. Earlier you mentioned that these seeds represent an inheritance from Neolithic Age, and it got me thinking about a different sort of inheritance. At the seed vault do you also store the intellectual and cultural capital of agriculture? Fowler: In a sense we do. We don’t have archives at the seed vault, but we do have a record of what is there, and even though in a sense the seed vault is a kind of safety backup for existing seed banks and their collections, you could also look at it the opposite way, which is to say that the seed banks that contribute to the seed vault are actually performing backup for the seed vault. There is redundancy in our system. Everything that’s in Svalbard can be found somewhere else, and that somewhere else is the main manager of that particular portion of diversity, and those institutions maintain extensive databases that describe everything they know about the traits and characteristics of every single sample. We link back to those and in that sense we have a very good record. Also, at the Global Crop Diversity Trust, we’re working with some other partners to put together a large international database called Genesys which will essentially unite all of these seed banks around the world so that researchers or plant experts who, for instance, may want to take a look at the whole diversity of rice or wheat can go onto one website and see what’s available and where it is and how to get samples of it and things like that. A lot of that information, characteristics and the history and so forth, is missing in some of the seed samples, but for the samples that do have it, it’s quite valuable and we try to maintain it. Why is it that Norway was chosen for this project? Is it just the geography or is there something particular about Scandinavian culture reflected in the seed vault? Fowler: I think it’s both. There are a lot of reasons for that particular location. One of them was historical; the Nordic countries, Norway, Denmark, Finland, Iceland, Sweden, were storing backup copies of some of their seeds in an abandoned mine shaft up there, so there was a precedent. But apart from that, Norway is special. Historically there have been a number of controversies around these genetic resources, questions of ownership and access and so forth, and I think Norway was at the top of the list in terms of the countries that everyone in the room trusted. They didn’t have a commercial seed industry so there was no sense of a conflict of interest or of a private interest being involved. Norway is just an unusually generous and collaborative country. When I headed the committee that undertook the feasibility study for the seed vault, and when we presented it to the government, their attitude was “if this is a valuable natural resource and Norway is the place to safeguard it, how can we say no?” And they jumped right in and built the facility at their cost. Some of your methods make it clear that terrorism is a special concern for the Seed Vault. I know that new seed shipments are screened with an airport x-ray scanner to make sure that none contain bombs. Is that because you see terrorism as just one of the many contingencies that could occur over the next thousand years, or do think the Vault might be a likely target for terrorism? Fowler: I don’t think it’s a likely target, but of course one can never know. No political or religious group is against what we’re doing so I don’t think it’s a target in that sense. When the vault was being built we performed a security assessment in order to assess the likelihood of it being a target, or the likelihood of it being under any kind of threat, and the Norwegian government deemed the threat to be extremely low. But, at the same time we thought that if we’re going to go to all the trouble to build this place in the middle of a mountain in the Arctic then we might as well go the whole distance, and we think that increases the trust and confidence in what we’re doing, the fact that we have thought through all of these contingencies even though we don’t think many of these things are ever going to happen. Television crews waiting outside the Seed Vault. I know that you have some interesting seed shipments coming in association with the anniversary. Are you particularly excited about any of them? Fowler: Two of them, actually. There is a very important, very historic dwarfing wheat variety coming from the United States. The short stature of modern varieties of wheat is very important, because it allows the wheat to carry more grain on the top without falling over. That’s a huge event in agricultural history that we’ll be able to preserve. The other one we haven’t publicized too much, because we didn’t want to draw too much attention to what is a very sensitive situation—we’re getting a large shipment in from ICARDA, an international agricultural research center in Syria. It’s not a Syrian government organization, it’s an international center and it’s completely independent from the government. Obviously, there are a lot of troubles in that country right now and that center, ICARDA, has been safety duplicating its material all along, as a good professional team will do, but the fact that this shipment is coming up right now in some ways points to the utility and value of the seed vault. One would not expect a seed bank, even in Syria, to be a target, but unfortunately there is a recent precedent: seed banks in Iraq and Afghanistan were destroyed or severely damaged over the course of the wars there, not because they were blown up or anything but because in the context of chaos and the breakdown of law and order, people have come in and looted them. So we’re pretty happy to have that collection at the vault. There seems to be a real cultural fascination with the vault. Have you had many interesting visitors in the fours years it’s been up and running? Fowler: Oh yeah. The surprising thing about the visitors is how many artists we’ve had come up and try to take a look at it. 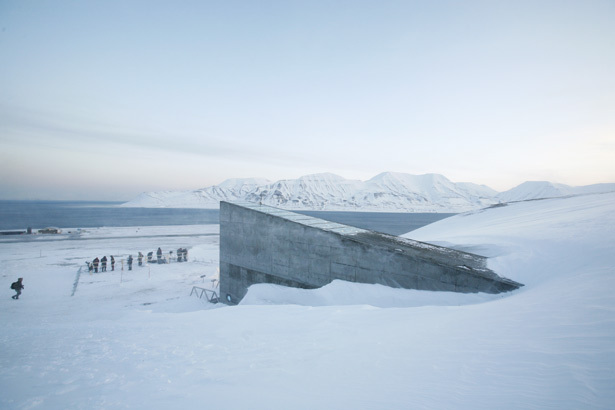 I get the sense that the seed vault must be the subject of many different art projects. Now it’s not a tourist attraction; we don’t just open it up for people all the time. In fact there’s no permanent staff there; we only go up to put the seeds in a couple of times a year. We do have a lot of monitoring there with people in the local community going up to check on it daily, but we monitor the facility remotely and they aren’t authorized to take anyone in. But, given enough advance notice and enough time to see who a person is and if there’s a real interest in them seeing it, we do have visitors there. We’ve had a number of political leaders, including Ban Ki-moon, the Secretary General of the United Nations. I think the most interesting tour, and it’s one I gave myself, was to former President Jimmy Carter and a group that he brought along, which included Madeleine Albright and a few others. I have a lot of admiration for him after having done that tour. Carter is famous for being a peanut farmer in Georgia, but not a lot of people know that his farm was devoted not just to producing peanuts but for producing peanuts for seed, so he knew the seed business very well. As I was giving the tour people in his group were asking all of these questions, and he was answering half of them. But as far as visitors go generally, when people go to the vault they seem to get very emotional; people feel something in there, and maybe it’s because they’re standing in the room with the greatest amount of biodiversity in the world, and the rich human history associated with that, people can feel that something important is happening. It has a big impact on people when they see it. An artist’s rendering of the vault.